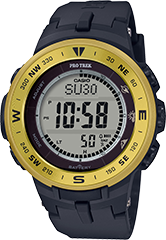 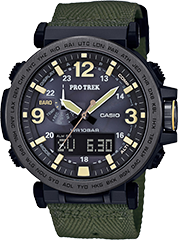 The PRG550-1A1 is a 3 hand analog watch model with an LCD window.The triple sensors measure compass bearing, altitude/atmospheric pressure and temperature.The multi-purpose second hand points towards magnetic north and can indicate the latest change in atmospheric pressure or show a change in altitude from a pre-selected location, depending on the function selected. 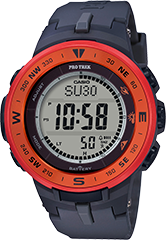 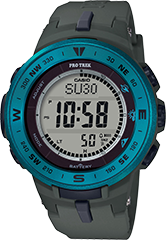 While the LCD displays numerical sensor information such as compass direction angle value, altitude, atmospheric pressure, and temperature, the PRG550-1A1’s full auto LED light activates with just a flick of the wrist and operates by Casio’s Tough Solar Power technology, allowing readings to be accomplished with ease. 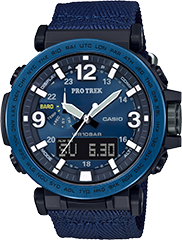 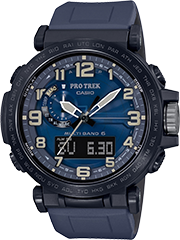 Casio’s Tough Solar Power technology adds to the PRG550-1A1’s efficiency by allowing the timepiece to power down when not exposed to light for a certain period of time, thus conserving energy. 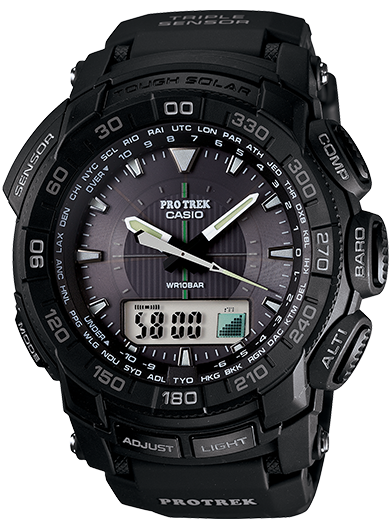 Black resin band analog and digital watch with black face.